You often think the place that you are going is Utopia, that is, until you reach the place. How many times have you look forward to a vacation after a year of slogging at work and after you went and came back and 6 weeks later, you realize there isn’t all that much to that vacation experience? I bet some of them would have left a deep impression but many of your vacation was not what you expected after all the anticipation. In life, we often think that something is an extremely good idea, that it is something that we will feel good about, and would be great when you reached it. Yet they often fall short of our perception. What was original a good idea didn’t work out in real life for us. When I was around 31 years old, I got to know the idea of being financially independent, and doing the math behind the financial independent concept, I realize it is possible for myself. So I became very motivated to follow this realistic path since you can rationally execute it. The nearer that I got to it, the more I anticipated it. When i read more, and got to know folks who have reached there, I realize almost all of them have a job in some form of another! So in the end you get to move from one job to another job. However, what if I do not have another job that I would like to do? Do I really hate my job now? So I did an experiment last year when I have a 9 day break from work. I did not go for a vacation but try as hard to simulate what would I do if I stop doing work. I realize I enjoy many parts of the slacking and not having to think about something serious at work, but they were replaced by more thoughts on wealth building, and lazy leisure thoughts. I realize how hard it is to stay motivated and lead a purposeful life. That experiment made me question whether what I strive for is really what is an ideal change. Through that experiment I learn what is missing in that very nice dreamland scenario and what I needed to do to supplement it. What I did was that I do not know if I would like what I have yearn for all this time. I have a sneaky feeling it might not turned out the way I hope for. So I wargame that scenario a little bit. And in a lot of destination, things, actions that you strive for, you can check whether your perception is correct or not. By wargaming that scenario, or simulating the actions, feelings, and repercussions that comes along with the scenario, giving that perception a realistic twist, it may strengthen your perception of what you look forward to , or make you realize its not worth hoping so much about it. When you are in your full time job, but develop a competency that enables you to earn on the side, you might see the possibility that, if you do this full time, it could turn out to be more lucrative then your current job. The benefit is not just monetary, but perhaps saving traveling time, and less administrative hassle to content with. It is the full package. Being a teacher, an IT engineer, a digital marketing specialist, a specialist consultant are some competency that comes to mind. To test this perception that this scenario is better, some companies might let you take up a 3 month or 6 month no pay leave. This would be an ideal period to see if you can garner enough business to be sustaining, whether you prefer the perk of being your own boss, whether you will miss interaction in the office context and whether you get anxiety panic of not knowing you will have enough clients to do this for the long term. To realize the value of their non-landed property, you may want to downgrade to a resale HDB flat. However, your family might not readily adjust from a condo environment to that of public housing. You might also want to realize the value of your flat by doing a geographical arbitrage by moving from a high value 5 room HDB flat to a 3 room that is away from town. Some of the factors that might not occur to you is how does your family and children adjust to a new neighborhood, a smaller living space, with drastically different room configurations. To test that perception, you could visit relatives that live in such spaces more regularly with your family, to observe how they live, and whether your family could adjust to something like that. Perhaps spend one year visiting the prospective neighborhood to see if you could adjust to the demographics and nature of people living in that area. If you are moving from a large housing to a smaller one, you could try to intentionally not use one room (perhaps rent it out even!) to see if your family can adjust to living with less space. You may not like your current industry, or taken interest in a more lucrative or fulfilling industry and would like to switch. What you think is suitable and appealing might have some significant differences that no one have told you yet, which ends up being your blindspot. The easy thing to do is really to “just do it” and take the plunge. Yet the sensible thing perhaps is to network better and talk to more people in the industry at your level, more senior level to gain a better perspective. The deeper you are able to dig the clearer your perspective on whether it is a good fit. Moving jobs, if bridges aren’t burnt, is a better proposition in case things doesn’t work out. I know many lady friends believing that this is the great situation to be in. There are a lot of benefits, the chief among the reasons is to spend time focusing on the children. While they may have considered the upside, the challenges can be how the finances will work out, and also like freelancing, the social circle changes. 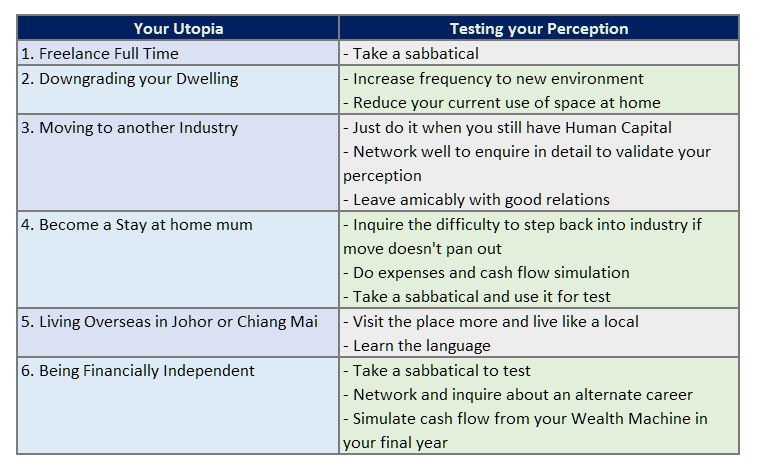 To test that perception, what worked for freelancing looks applicable to simulate Stay at home mum as well. It should be noted that one chief worry is that if this does not work out, the mother loses valuable human capital to re-enter the workforce. More research done specifically for woman in your particular industry, talking to more experienced mentors might provide more clarity here. Being a stay at home parent need not be a permanent thing with no backdoor. My manager is one who left the workforce to be with the children, and found a job managing us when she re-enters. This is something that many workers who are not location dependent would aspire to do. And many only see the upside and seldom talked about the downside. One common downside is similar to that of free lancing, not being able to find consistent, sizable work due to not being in the same locale. The culture and language barrier, the weather and security might be something that you currently take for granted. You might also not be sure that you can do this for the rest of your life. To make sure your perception that the area fits you, you could take more trips, perhaps lengthy trips to the place and explore them, not in a tourist function, but as someone wanting to live there. For example, my friend really likes Taiwan on his few visits, and envision staying there once he made his pot of wealth. In the mean time, he went up 4 times per year to Taizhong, and have become rather familiar with the area, living for a short stint like what the locals did. He has started to test that perception already. If you are planning to live in Johor, rent out your Singapore apartment and travel to Singapore from Johor to work, one simulation could be to rent AirBNB in the state for 1 week, and test out the concept to see if you can adjust to living there and traveling to Singapore to work. I shared my experience on some of the things and feelings that you might feel uncomfortable about. Would you lose a certain purpose now that there are no corporate KPI to keep you busy? Would you eventually not like the way you become by only doing one or two things a day? If you are semi-independent (check the stages of wealth meter where you are), would that job that earns you much less also make you feel less fulfilled? Would your parents and spouse ask you to do something you don’t want just because you don’t have a job? Would my Wealth Machine(s) generate the adequate cash flow to be financial independent? You can test out some of these worries if you take a 6 month, 1 or 2 year sabbatical. Particularly, the 6 month no pay leave would work well here again. To ascertain if the cash flow from your Wealth Machine(s) can be managed well, for the last year, you can put aside your earned disposable income from you and your spouse job, and rely only on the cash flow from your Wealth Machine(s) and see if that would be a problem. You may realize that you have adequate, not enough, or that you need to tweak your wealth system & process a bit. For a lower paying job, consult folks doing those jobs. This could be actively engage using your interpersonal skills to make friends with them even though you do not know them. Ask deeper questions and then go back and reflect if you can live with those way of doing things. You might want to inquire whether you will have enough freedom if you are more efficient in the job to have your boss not bother with you so much. Why we do this is so that we don’t work towards something that may eventually not what you really wanted, that is far from what you were thinking in the mind. It might turn out that the scenario is what you want, but with some negative points. You can then have time to work out a solution for these negative points. What do you think? Is this being overly safe, or you prefer to just whack and risk being shocked that this is not what you are looking for? Have you tested your perception before in a similar fashion? Well said and very true! SMOL (Singapore Man of Leisure) also didn’t everyday do leisure. Not sure how other Non-SMOL can do it? He switches from corporate job to weekends on ground and trade NOT to escape. Not easy for healthy and able bodies to laze around after reaching financial independence when one has no younger dependents to take care. Great advice, full of executable ideas. It is quite prudent to take a mouthful of the greener grass on the other side first to test whether the grass just looked greener from the distance or whether it does actually taste better too. Because some people spend more time planning a two-week vacation than they do retirement planning (in case that is really one of their life goals). oh no. they didn’t even know the magic figure, or are usually far from it, so it wasnt a consideration until they are held prison by the magical 65 years old age. Thanks for the great article. Been an avid follower of your blog and this is my first time commenting =). I am currently on a soon-to-be 1 year sabbatical, and I must say that it has clarified a lot of my perspectives about life as well as the financial independent dreamland as you talked about. I think the best part of a sabbatical is that you get to re-discover the more important things in life, and hopefully, place more emphasis on those aspects of life. Too many people have a misplaced sense of purpose or importance from their corporate jobs, as if life revolves around them. Going on an extended solo travel trip or participating in some volunteer work will really help to re-adjust such life perspectives, in my humble opinion. Sorry for the long comment, and please keep up the good writing. Cheers! Thanks for reading and no worries on the long comment, i appreciate your frank views. Perhaps you can share a little bit on why you decide to take a 1 year sabbatical. I think you are right that it allows you to identify what you missed the most, which probably would be a key criteria on what you look for in the next employment. In my case, it was just being stuck in the comfort zone of for too long, and the desire to step out and try something else for my career, before I get stuck with future commitments like marriage, mortgage loans, or having kids, etc. I did not want to be saying all sorts of “If only I have done that when I was younger” when I got older. It also gave me time to catch up on my reading on personal financial management and I found the book “Money: Master the Game”, by Tony Robbins, to be particularly useful for me. Coupled with reading your blog post on the wealthy calculator, I was able to calculate how much I need in my Wealth Machine for my own financial independence, and hence motivation to work towards it. In the past it has always been the case where I know I want to achieve Financial Independence, but always have vague ideas on how much is required, and have always assumed huge sums that seem unattainable. So, thanks for the great articles you have been writing and hope to see more great stuff coming up from you! Hi Haduken, thanks for explaining. It certainly brings a smile to my face that my articles have touched lives. I hope you stick around and contribute your point of view! Great article. Full of good ideas and how to. Keep up the writing! Hey RB35, great seeing you around and thanks for the support.